Silas Marsh the sailor and Akachi Onyele the shaman were trying to stop Azathoth. This was on ‘easy’ difficulty, with the hard (tentacled) Mythos cards removed from the deck. They got off to a good start, gaining lots of spells and equipment using bank loans and clearing the debts with influence. The first mystery was solved fairly quickly without the doom track dropping much. However, before long a lot of rumors were hanging around, waiting for that first reckoning. Posted in Blog Posts on December 28, 2013 by Tim. We played our first game of Eldritch Horror as a six-player session. We chose the Great Old One Azathoth for a simple introduction. The investigators were Josephine Fine the psychic, Lily Chen the martial artist, Mark Harrigan the soldier, Trish Scarborough the spy, Diana Stanley the ex-cultist, and Lola Hayes the actress. Posted in Blog Posts and tagged Eldritch Horror on December 27, 2013 by Tim. The Tannhauser Matriarchy Troopers come with purple coats, and since they are Russian, I thought a grey winter style would be good as an alternate colour scheme. Posted in Blog Posts and tagged Painting, Tannhauser on December 24, 2013 by Tim. I got an early Christmas present of Eldritch Horror, the new game from the Fantasy Flight Games Arkham Horror stable. It is AH on a global scale with streamlined, story-driven rules. 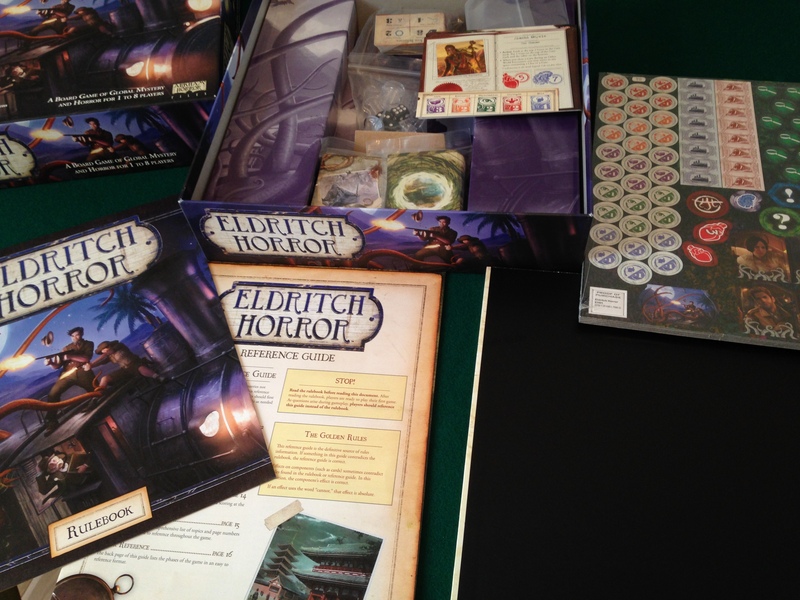 Posted in Blog Posts and tagged Eldritch Horror, Unboxing on December 23, 2013 by Tim. I have two Tannhauser Frankenstahl figures, so I need to be able to tell them apart. They should have the same general colour scheme, which is industrial and zombie-like (i.e. Frankenstein’s monster), so I made the second one blue-skinned, with yellow fusion glows. Posted in Blog Posts and tagged Painting, Tannhauser on December 22, 2013 by Tim. I fancied doing some painting so I had a go at my Tannhauser Natalya figure. Posted in Blog Posts and tagged Painting, Tannhauser on December 20, 2013 by Tim. The climb is steep as they approach the Thistletop peak. The ruins stand stark against the fading sunlight. “Summoning Lamashtu seems overkill to me,” says Amiri. Sajan holds the crude map that the goblin had scrawled. He points at the entrance to the dungeon complex that lies under the ruins. There is a faint sound of chanting. The summoning ritual has begun and there is no time to lose. Posted in Blog Posts and tagged PACG, Pathfinder Adventure Card Game, session report on December 15, 2013 by Tim. Amiri lifts her boot from the goblin’s throat. They are in the foothills surrounding Thistletop, the mountain home of the goblins. Seelah shades her eyes and scans the skyline. “That weird goblin druid has made his lair up there somewhere,” she says. Posted in Blog Posts and tagged PACG, Pathfinder Adventure Card Game, session report on December 11, 2013 by Tim.